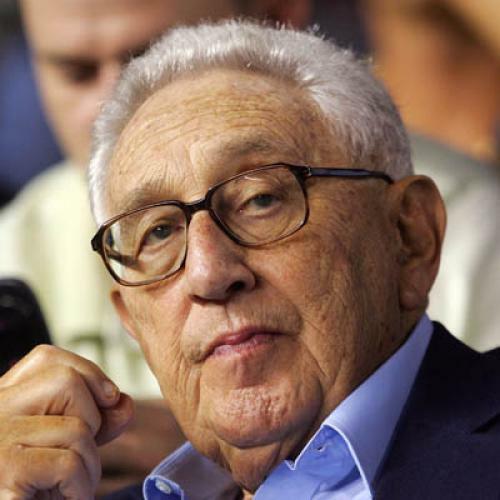 Henry Kissinger may be the most influential figure in the making of American foreign policy since the end of World War II, and he is certainly the most prolific. Since stepping down as secretary of state in 1977, Kissinger has written eight books, totaling more than seven thousand pages and several million words. And this is to say nothing of the five books he wrote before attaining high office, and the innumerable articles, essays, and speeches he has produced since. Like the man himself, these works are ambitious, prolix, self-serving, and at times brilliant. Now there are these six hundred pages on China. Kissinger remains a professor at heart. He still sees himself as a theorist, an analyst, and a teacher, albeit one with a maddeningly obtuse, stubborn, and habitually misguided pupil. For over half a century he has sought to temper, if not to dispel, the idealistic illusions of his countrymen, and to educate them in the harsh realities of power politics. This book may not be Kissinger’s last will and testament, but it does contain a recapitulation of the basic themes and ideas that have been present in his work since his days as a graduate student. Though his roots, personal and intellectual, are in Europe, once in power Kissinger was thrust into the unfamiliar complexities of Asia. The struggle to achieve “peace with honor” in Vietnam and the re-opening of relations with China were, respectively, his greatest frustration and his greatest achievement. Like many a famous figure before him, he is here reliving some of the most dramatic, consequential, and gratifying events of his career. But Kissinger is no sentimentalist. Like virtually everything else he has written, this book has a practical purpose. On China is an attempt to apply the principles of foreign policy “realism” to the most pressing strategic challenge of our day. It is also, inadvertently, an illustration of why such an approach, taken alone, is inadequate, both for anticipating the behavior of an increasingly powerful China and for prescribing an appropriate American strategy to deal with China’s rise. In an age when others are preoccupied with “soft power,” “smart power,” non-state actors, and non-governmental organizations, Kissinger has remained firmly focused on what he believes is still the essential business of world politics: the management of relations among great powers. For him, the goal today is the same as it was during the cold war, or the period after the Napoleonic wars that he analyzed in his first book. Perpetual peace is an unachievable dream. The best one can hope for is a measure of stability, made possible by self-restraint, mutual accommodation, and, above all, the acceptance of certain minimal principles of international order. This will be impossible, of course, without the constant exertions of wise, skillful, and prudent leaders. Long before he became one himself, Kissinger saw statesmen as the central players in the drama of world history. Heroic, creative, even artistic, they are also ultimately tragic figures. Their task, as he once described it in A World Restored, is to recognize the “real relationship of forces,” to distinguish what is attainable from what is desirable, and to make this knowledge serve their ends. Contrary to the American slogan, failure is always an option, and in a world of constant flux success is never permanent and often proves fleeting. WHILE THE BULK of On China is devoted to tracing the evolution of relations between the United States and the People’s Republic, Kissinger seeks to place this more recent story in a wider historical context. In his opening chapters he discusses the origins of China’s civilization, its long run as East Asia’s pre-eminent power, and its precipitous decline in the face of intrusions by the West. Kissinger stresses China’s “singularity,” its unparalleled longevity as a coherent society with a strong collective identity and its own sense of uniqueness. Out of their many centuries of experience, he writes, the Chinese have distilled a characteristic style of statecraft “distinctly different from the strategy and diplomacy that found favor in the West.” Rather than attempt to crush an opponent with superior force, traditional thinkers in China “placed a premium on victory through psychological advantage and preached the avoidance of direct conflict.” The Chinese approach to strategy has always stressed “subtlety, indirection, and the patient accumulation of relative advantage.” This is a style that Kissinger clearly admires. He detects it in contemporary China as well as in ancient Chinese diplomacy. Following China’s entry into the Korean War, it seemed obvious that the West faced an ideologically unified “Sino-Soviet bloc.” Suggestions to the contrary were seen as naïve, possibly even treasonous. Washington’s unyielding anti-Communism was more than matched during the 1950s and 1960s by Mao’s fanatical pursuit of “continuous revolution” at home and his support for world revolution abroad. When they finally met in 1972, Richard Nixon reportedly told Mao that what mattered was “not a nation’s internal philosophy” but rather “its policy toward the rest of the world and toward us.” As good realists, Nixon and Kissinger were not overly concerned that the hands they shook in Beijing were soaked in the blood of China’s own people. Looking back, Kissinger devotes more attention than in his previous writing to the barbaric madness of Mao’s internal policies, most notably the “Great Leap Forward” that resulted in a famine that took at least twenty million lives, and the “Cultural Revolution” that upended China’s society and all but destroyed its educational system. But Kissinger acknowledges that in each case success came at significant longterm cost. In 1962, for example, Chinese action deterred further Indian probes along their disputed border, but it also “added another formidable adversary ... at a moment when relations with the Soviet Union had gone beyond the point of no return.” For all their ancient wisdom and supposed subtlety, Chinese statesmen appear to be fully capable of shooting themselves in the foot. Nor is this failing unique to Mao. Although Kissinger presents it as a brilliant success, Deng Xiaoping’s decision in 1979 to use force to punish Vietnam for invading Cambodia cost China dearly in terms of lives and military prestige. Jiang Zemin’s attempt, in 1995-1996, to influence Taiwan’s first free presidential election by lobbing ballistic missiles into waters off the island also backfired badly, arousing American anxiety and driving Taiwanese voters toward the pro-independence party. Similarly, Beijing’s recent handling of territorial disputes with Japan and in the South China Sea appears to have erased the effects of a decade of “smile diplomacy.” Heavy-handed bullying may not reflect China’s ancient strategic culture, but it is fully consistent with the character and the internal behavior of its one-party authoritarian regime. THE SECOND PHASE of the American relationship with China began, in Kissinger’s account, in 1969, with the election of Richard Nixon and the elevation of a little-known Harvard professor to the position of national security adviser. Although this is mostly familiar ground, Kissinger draws on recently declassified “memorandums of conversation” to describe in more complete detail his crucial early encounters with Mao and Zhou Enlai. These meetings were the beginning of what was, for Kissinger, the golden age of Sino-American relations, and not only because it marked the peak of his personal influence. Kissinger suggests that the main brake on the subsequent development of strategic cooperation was Beijing’s reluctance to acknowledge any weakness or vulnerability, and also its stubborn insistence on maintaining the appearance of self-reliance. But this is only half the story. Regardless of what a cold-blooded calculation of national interest seemed to require, neither Kissinger nor his successors could easily break America’s long-standing ties to an anti-communist ally. Here American domestic politics played the disruptive role that Kissinger deplores: if not for congressional demands for continued support to Taiwan, the quasialliance between the United States and China would have gone further, faster in the 1970s and 1980s than it did. Such progress probably would have done little to hasten the end of the cold war, but it would certainly have come at a price. Instead of having the time to mature into the vibrant democracy it is today, Taiwan would long since have been consigned to the not-so-tender mercies of the mainland. TWO WORLD-SHAKING EVENTS ushered in the third and most recent stage in Sino-American relations. In June 1989, China’s leaders authorized the use of force to clear student demonstrators from Tiananmen Square and began a harsh nationwide crackdown on suspected dissidents. Five months later, in November, the Berlin Wall fell, leading to the rapid unraveling of the Soviet empire and the eventual disintegration of the Soviet Union itself. Kissinger’s treatment of Tiananmen will not endear him to critics who see him as more sympathetic to the instigators of the violence than to its victims. While he does not condone the use of force against unarmed protesters, he seems to regard it as an understandable response to “the historical Chinese fear of chaos and memories of the Cultural Revolution.” And he clearly holds the protesters at least partly responsible for the fate that befell them. After all, he writes, “the occupation of the main square of a country’s capital, even when completely peaceful, is also a tactic to demonstrate the impotence of the government, to weaken it, and to tempt it into rash acts.” This is not quite the same as saying the protesters got what was coming to them, but it comes awfully close. What finally concerns Kissinger most about Tiananmen is not what Beijing did, but how Washington responded to what Beijing did. He accepts as a matter of empirical reality that America’s commitment to a universal conception of human rights means that at some point “abuses are bound to evoke ... [a] reaction.” But the danger is that “such events can drive American foreign policy beyond national interest calculations.” Kissinger thus gives George H.W. Bush high marks for handling the Tiananmen crisis with “skill and elegance,” imposing some comparatively mild sanctions while deflecting congressional pressure for tougher action, and offering rhetorical reminders of America’s founding principles while quietly reassuring Beijing of its commitment to continued friendship. Here and in his conclusion Kissinger suggests a stark dichotomy between wise advocates of “engagement” and unnamed ideological hotheads (“neoconservatives and other activists”) who favor maximum pressure to bring about “regime change.” Yet he admits elsewhere in his book that “the actual distinctions are more subtle.” Reckless provocation and passive acquiescence have never been the only available options. Today, as in 1989, the real challenge is to find ways of interacting with the Chinese state, and with Chinese society as a whole, so as to encourage long-term political change. The Clinton administration’s brief attempt to use trade sanctions to force Beijing to make reforms clearly did not succeed; but neither have the last twenty years of unconditional economic engagement. The larger significance of Tiananmen is that it marked the end of the “ideological armistice” between the two Pacific powers. This was due in part to the shocking nature of the events themselves, and the brutal reminder they offered of the true nature of the regime in Beijing. Even more important were the fall of the Berlin Wall and the subsequent collapse of the Soviet Union. In the wake of these developments, “as Beijing and Washington assessed the new landscape, they found their interests no longer as evidently congruent as in the days of the near alliance.” The original impetus for strategic cooperation, and for downplaying ideological differences, was suddenly gone, and it was far from obvious what, if anything, would take its place. This may be a laudable goal, but there are good reasons for believing that it will be extremely difficult to achieve. The first of the impediments to Kissinger’s vision can be found in the Kissingerian realm of geopolitics. For virtually the entire period discussed in this book, and certainly during Kissinger’s years as a policymaker, China was painfully weak—but today it is rising rapidly, and beginning to narrow the still substantial gap in wealth and power that separates it from the United States. This fact creates a new and potentially dangerous situation that is all too familiar to students of international history. Kissinger acknowledges the problem in a brief discussion of the Anglo-German relationship on the eve of World War I. At the turn of the twentieth century, it was Germany’s fast-growing strength, and especially the expansion of its fleet, that provoked mounting anxiety in the leading power of the day. Uncertain of German intentions, the British ultimately concluded that they needed to respond by accelerating their own naval buildup and forming alliances with other powers in an attempt to counterbalance Germany. Kissinger presents this historical vignette as a warning, an example of a previous instance in which mutual suspicion created self-fulfilling prophecies and triggered what was, by implication at least, an avoidable tragedy. What he does not emphasize is that the Germans, seeking their “place in the sun,” did in fact harbor aggressive intentions, and that the British had little choice but to react to them. If anything, the British response to Germany’s rise was too timid: a stronger commitment to defend France and the Low Countries, and a larger land army with which to back it up, might have had a better chance of deterring German aggression. The situation between the United States and China today is nowhere near this dire, at least not yet; but there are troubling signs. Kissinger speculates that, if it were to adopt an assertive and highly competitive stance, “China would try to push American power as far away from its borders as it could, circumscribe the scope of American naval power, and reduce America’s weight in international diplomacy.” Although presented as a hypothetical possibility, this appears to be precisely what Beijing is now seeking to accomplish. China’s current rulers seem intent on eventually displacing the United States and re-establishing their own country as the pre-eminent power in East Asia. In light of China’s historic role and its civilizational “singularity,” it would not be surprising if this were a position to which they felt themselves entitled. Kissinger clearly hopes that high-level diplomatic exchanges and mutually reassuring gestures can satisfy Beijing’s demands for influence proportionate to its growing power, and protect American equities in Asia, and unwind what might otherwise become a self-reinforcing cycle of mistrust and rivalry. This would not be easy, even under the best of circumstances, but ideology and domestic politics will make it even harder. Like it or not, the American people are not going to abandon their notion of themselves as the citizens of a country that is the embodiment, and the foremost defender, of certain universal values, and they are going to continue to regard with suspicion and distaste regimes that cruelly flout them, especially ones that seem to be growing in power. The United States might be willing to relinquish its preponderant position in Asia to a democratic China, but it will resist the efforts of an authoritarian regime to displace it from the region. For their part, no matter what the Americans say or do, China’s current rulers are going to continue to view the United States as a crusading ideological nation whose ultimate aim is to see them replaced by democratically elected leaders. They are not entirely mistaken in this regard. Any rising power, regardless of regime, would want to exert a greater influence over its neighborhood. But its exaggerated fears of encirclement and subversion are what drive the present government in Beijing to want to neutralize America’s military power, weaken its alliances, and push it back from China’s frontiers. The desire to preserve Communist Party rule is the overarching factor that shapes every aspect of national policy, foreign as well as domestic. REALISTS HAVE LONG fretted about the disruptive impact of America’s domestic politics on its China policy, but in the future the problems are more likely to originate from within China itself. After Tiananmen, a policy of continued engagement was justified to the American people in terms of its presumed economic benefits, and by the claim that increasing prosperity in China would pave the way for political liberalization. Twenty years later, disputes over trade imbalances, exchange rates, and intellectual property rights have caused some serious observers to question whether the existing economic relationship is as beneficial to the United States as has so often been claimed. In any event, continuing friction over these issues could weaken the force that has been primarily responsible for holding the two nations together since the early 1990s. Meanwhile, hopeful post-cold-war predictions that the Communist Party of China would soon follow its Soviet counterpart into the dustbin of history have proved sadly wide of the mark. The recent pre-emptive crackdowns on journalists and dissidents in the wake of the “Arab spring” are drawing attention once again to the regime’s lack of confidence in its own legitimacy. Despite these troubling developments, the American people remain broadly supportive of engagement. Still, there is evidence of increasing concern about what the future may hold. This is not a matter of ill-informed emotionalism. Popular attitudes about China seem in many respects to be more balanced, prudent, and “realistic” than those of the nation’s foreign policy elites. One recent poll found that, while 50 percent of the public had basically favorable attitudes toward China, 53 percent of those questioned also recognized that it could at some point pose a threat to American interests and security. When members of the Council on Foreign Relations were asked the same question, by contrast, only 21 percent were prepared to acknowledge the existence of this seemingly obvious danger. And while China may not be liberalizing, its domestic political system is changing in ways that could make the country less predictable in its external behavior and more difficult to deal with than it was in Kissinger’s time. The rising generation of Party cadres, military officers, and business leaders is more self-confident and less patient than its predecessors. Those in their thirties and forties have known nothing but rapid and sustained increases in wealth, power, and prestige. They are also the products of a school system that, since the early 1990s, has placed less emphasis on Marxist dogma and more on “patriotic education.” An increasing number believe that it is time for China to truly “stand up,” to reclaim its former greatness and to settle old scores with its historic rivals. Kissinger notes that there is an increasingly open and wide-ranging debate in the Chinese elite about China’s future world role, but he seems reluctant to confront the nature of that Chinese debate. A substantial portion of the voices being heard express views that are highly nationalistic, assertive, and even hostile toward other countries. What is more, such sentiments clearly strike a responsive chord in at least a part of the Chinese public. Faced with rising domestic discontent or a faltering economy, the authorities are likely to resort more frequently to pugnacious expressions of national pride designed to deflect popular anger toward external enemies. China’s recent behavior toward Japan and its smaller Southeast Asian neighbors may be early signs of this larger trend. Having stirred nationalist passions, Beijing may find it more difficult to take a conciliatory stance on contentious foreign policy issues, even when it might be in the nation’s strategic interest to do so. This is especially likely to be the case owing to ongoing changes at the very pinnacle of the Chinese political system. The days when a single strongman could reverse the country’s course virtually overnight are gone forever. Decisions are now the product of bargaining among a group of comparatively weak civilian leaders, none of whom wants to appear “soft” in relation to his colleagues. While they remain subordinate to the Party, other organizations and interest groups, most notably the People’s Liberation Army, appear to be exerting more influence on policy. Taken together, these changes are more likely to incline China toward greater assertiveness than toward an increased appetite for accommodation. In the forty years since Kissinger first visited China, that country has been altered beyond all recognition. But Kissinger himself, in his views on the conduct of international affairs, has remained essentially unchanged. His ideal is still a world in which farsighted statesmen, somehow shielded from the winds of ideology and politics, guide the fates of great nations by the lodestar of national interest. If reality ever approximated this image, it was only for a brief moment, when he was at the helm; but it is certainly no longer the case today. For as long as China continues to be ruled by a one-party authoritarian regime, a stable “Pacific Community” of the sort that Kissinger desires will remain a pipe dream. The divergence in interests and values between the United States and the People’s Republic is too wide, and the margin of trust too narrow, to permit such an arrangement. This does not mean that diplomacy will be unimportant or cooperation impossible, but the ambit for both will remain limited, and it is likely to narrow further as China’s strength, and its ambitions, continue to grow. While they wait for China to liberalize, the United States and its regional friends and allies are going to have to work harder, and cooperate more closely, in order to preserve a favorable balance of power in Asia. If they fail to do so, their ability to resist coercion, deter aggression, and maintain their freedom of action will decline, and the risks of miscalculation and conflict will grow. These are realities that a consummate realist such as Henry Kissinger must be prepared to acknowledge. Aaron Friedberg is a professor of politics and international affairs at Princeton University. His latest book, A Contest for Supremacy: China, America, and the Struggle for Mastery in Asia, has just been published by W.W. Norton. This article originally ran in the August 4, 2011, issue of the magazine.